As Texas prepares to face Michigan on Friday in the Sweet 16, the Longhorns’ offense is, perhaps quite literally, hitting its stride. 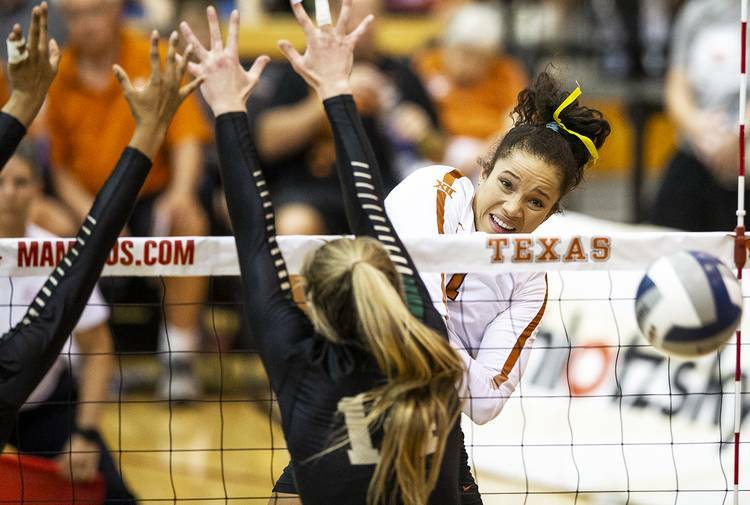 Texas, ahead of its upcoming appearance in the BYU regional, ranks second nationally with a .312 hitting percentage. Freshman Logan Eggleston had 30 kills and only three attacking errors in UT’s tournament-opening sweeps of Stephen F. Austin and Texas State. Senior Yaazie Bedart-Ghani has had a cache of career-defining postseason moments, including last year’s 12-kill performance coming off the bench in the Sweet 16. Middle blockers Brionne Butler and Morgan Johnson are both hitting better than .350. “I don’t know if you noticed, but they play the game a lot higher above the net than we do,” SFA coach Debbie Humphreys joked after UT ended the Ladyjacks’ season a week ago. The biggest weapon in the arsenal is junior Micaya White’s right arm. A shoo-in for AVCA All-America honors — which would keep alive her chance of becoming UT’s fourth four-time All-American — White has already been named the top player in the Big 12 and AVCA Southwest Region. Her averages of 3.87 kills and 2.41 digs per set are both better than her career marks. A hitting percentage of .306 is a career-high. White’s development as a six-rotation player has been stressed this season by coaches. Head coach Jerritt Elliott said White has really focused on her defensive passing. White’s kryptonite has been at the service line, where she uses a high-risk, high-reward “jump top-spin” serve. She has been responsible for 62 of UT’s 240 service errors this season. White, though, does have 19 aces and she served nine straight points against Texas State last Friday. This weekend, Texas will need White’s star to shine the brightest in a field that also includes Michigan’s Carly Skjodt, BYU’s Roni Jones-Perry and Florida’s Thayer Hall. Like White, Jones-Perry also was named a regional MVP (Pacific South) by the AVCA. A Final Four mainstay from 2012-16, Texas is aiming to return to the NCAA’s biggest stage after falling short in the regional finals last year. The Longhorns (22-4) have won 12 straight matches. Friday’s regional semifinals: No. 5 Texas (22-4) vs. Michigan (24-9), 3 p.m.; No. 4 BYU (29-1) vs. Florida (26-6), 5:30 p.m.
Saturday’s regional final: 7 p.m.